Bavaria Premium Lager cans launched in honour of Valletta 2018, European Capital of Culture. 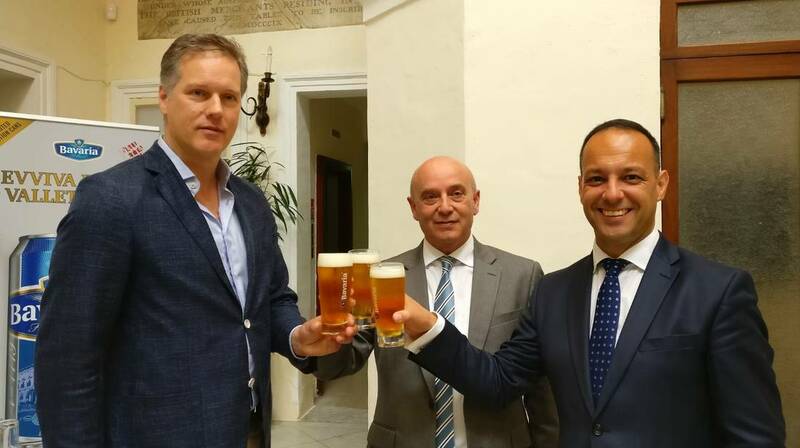 GSD Marketing Ltd and Bavaria, official partners of Valletta 2018, have launched two limited edition Bavaria Premium Lager cans in honour of Valletta, host of the European Capital of Culture title for 2018. The two limited-edition Bavaria beer cans feature the iconic Valletta Skyline and the Auberge de Castille. ‘’GSD Marketing Ltd is honoured to be one of Valletta 2018’s official partners. We want to display some of Valletta’s heritage inspired by Valletta’s iconic its domes, spires and spectacular historical fortifications, as well as Auberge De Castille, one of the finest architectural works in Valletta. It is with great pride that, thanks to our partnership with Valletta 2018 and Bavaria, we present the Bavaria Valletta 2018 Limited Edition’’ said Martin Agius, Senior Sales and Marketing Manager at GSD Marketing Ltd.
Valletta 2018 Chairman, Jason Micallef, said that he is very proud that GSD Marketing Ltd are Valletta 2018’s premium partners, and that he is very happy that they have chosen Valletta to feature on their limited-edition Bavaria packaging. Bavaria Premium Lager is a clear pilsner that is easy to drink, with a pleasant, slightly bitter aftertaste. It is brewed with barley malt, wheat, natural mineral water from Bavaria’s own spring and hop, and has a refreshing, fruity and slightly hop-like taste, with a full flavour which is beautifully balanced. ’’Bavaria’s limited-edition packaging invites consumers to celebrate Valletta’s prestigious title of European Capital of Culture, as well as Maltese culture and history and Bavaria is proud to be part of this. “Eviva l-Belt Valletta, il-Kapitali Ewropea tal-Kultura 2018’’ said Peter Evan, Senior Export Manager Europe at Bavaria N.V.
Bavaria Valletta 2018 limited edition will be available in both on trade and off trade.